Police officers, a police dog, ambulances and the police helicopter responded to a report of a stabbing at 1.50am yesterday – but when they got there they discovered it was a fake. Two people were arrested after units arrived at a flat in Sutton Drove in Seaford and found there was no emergency, according to police. A Sussex Police spokesman said: “Police received reports of a stabbing in a flat. “Officers attended the address and quickly established the phone call police received was false. “A 26-year-old man from Seaford was arrested on suspicion of perverting the course of justice, obstructing or resisting a constable in execution of duty and burglary dwelling with intent to steal. 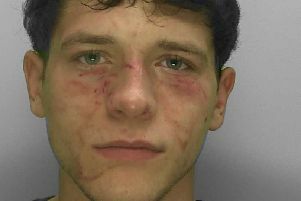 “A 22-year-old man from Eastbourne was arrested on suspicion of conspiracy to prevent to cause of justice, causing wasteful employment of police, criminal damage, common assault and burglary dwelling and theft with no violence. As well as officers, a police dog, ambulances and the National Police Air Service helicopter all attended the scene. Inspector Mark Rosser took to Twitter to warn people about making false reports.